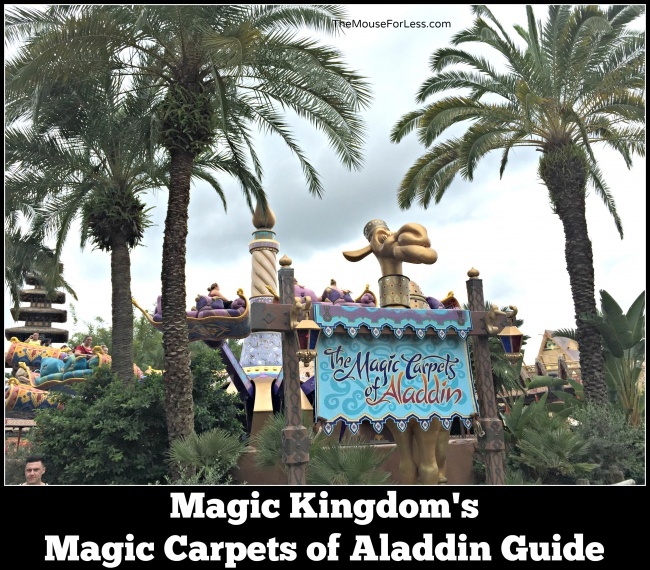 Guests of all ages can find their inner Jasmines and Aladdins from Disney’s classic 1992 film Aladdin on this Magic Carpet ride. Shopping: Guests can purchase various goods and souvenirs in Adventureland’s five shops: Agrabah Bazaar, Island Supply by Sunglass Hut, La Princesa de Cristal – Caribbean Plaza, Plaza del Sol Caribe Bazaar, and Zanzibar Trading Co.
Dining/Refreshment: Several counter service restaurants are located near The Magic Carpets of Aladdin in Adventureland. The popular Aloha Isle and Sunshine Tree Terrace locations specialize in ice cream, the former serving the cult-favorite Dole Whip and the latter the Citrus Swirl. Additionally, Mexican cuisine, including burritos and rice bowls, are served seasonally at Tortuga Tavern. Restroom: There are two restrooms in Adventureland, one near Tortuga Tavern and another near Pirates of the Caribbean. The spitting camel at the attraction’s entrance was part of the Aladdin’s Royal Caravan parade, which ran at the then-Disney MGM Studios from December 1992 to August 1995. 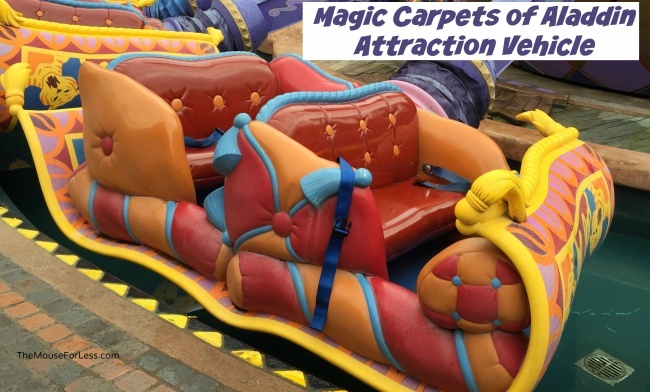 16 Magic Carpets are featured in The Magic Carpets of Aladdin. Another version of The Magic Carpets of Aladdin, Flying Carpets Over Agrabah, opened at the Walt Disney Studios Park at Disneyland Resort Paris on March 16, 2002. A related attraction, Jasmine’s Flying Carpets, debuted at Tokyo DisneySea at Tokyo Disneyland Resort on July 18, 2011. Look for a Hidden Mickey entrenched in the pavement outside The Magic Carpets of Aladdin. Guests in the front row of the carpet can control the carpet’s height. 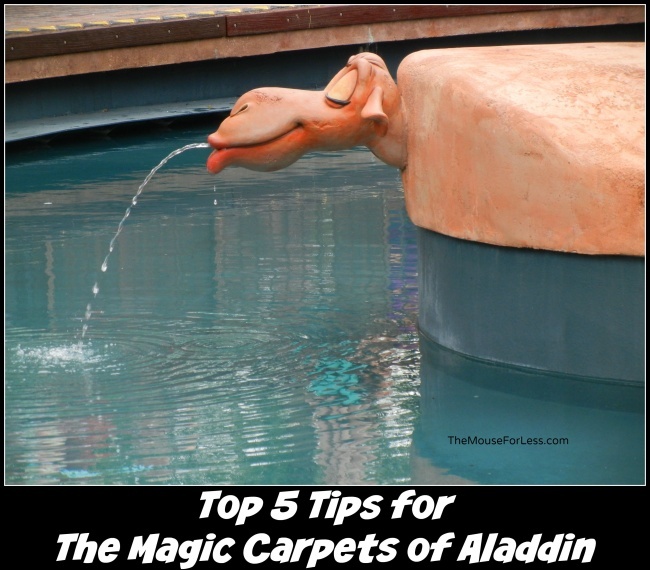 Guests in the back row of the carpet can control the carpet’s tilt, either forwards or backwards. Make a wish on the Magic Lamp atop the attraction! This attraction is a good alternative or counterpart to the classic Dumbo the Flying Elephant attraction in Fantasyland. If you enjoy The Magic Carpets of Aladdin, be sure to check out TriceraTop Spin at Disney’s Animal Kingdom.